﻿ 2 Corinthians 1:4 who comforts us in all our affliction so that we will be able to comfort those who are in any affliction with the comfort with which we ourselves are comforted by God. who comforts us in all our affliction so that we will be able to comfort those who are in any affliction with the comfort with which we ourselves are comforted by God. He comforts us in all our affliction, so that we may be able to comfort those who are in any kind of affliction, through the comfort we ourselves receive from God. who comforts us in all our suffering, so that we may be able to comfort others in all their suffering, as we ourselves are being comforted by God. who encourages us in all our affliction, in order for us to be able to encourage those in every affliction, through the encouragement of which we ourselves are encouraged by God. 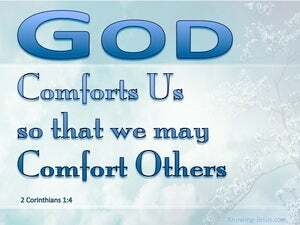 Who comforts (consoles and encourages) us in every trouble (calamity and affliction), so that we may also be able to comfort (console and encourage) those who are in any kind of trouble or distress, with the comfort (consolation and encouragement) with which we ourselves are comforted (consoled and encouraged) by God. He comforts us in all our troubles so that we will be able to comfort those who are in any [kind of] trouble, through the comfort we ourselves have received from Him. who con soles us in all our afflictions, so that we are able to comfort those who are in any affliction, with the comfort with which we ourselves are comforted by God. who comforteth me in all my tribulations, that I may be able to comfort them who are in any trouble, by the comfort wherewith I myself am comforted of God. who encourages us in all our tribulation, that we may be able to encourage those who are in any tribulation whatever, through the encouragement with which we ourselves are encouraged of God. He comforts me in all my trouble, so that I can comfort people who are in any trouble with the comfort with which I myself am comforted by God. 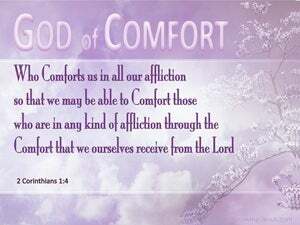 Who comforteth us in all our affliction, that we may be able to comfort them who are in any affliction, by the comfort wherewith we ourselves are comforted of God. who comforts us in all our tribulation, that we may be able to comfort those who are in any trouble with the comfort with which we ourselves are comforted by God. Who comforting us upon all our pressure, that we may be able to comfort them in every pressure, by the comfort by which we ourselves are comforted by God. Who comforts us in all our tribulation, that we may be able to comfort them who are in any trouble, by the comfort with which we ourselves are comforted of God. who comforts us in all our affliction, so that we may be able to comfort those [who are] in all affliction with the comfort with which [we] ourselves are comforted by God. 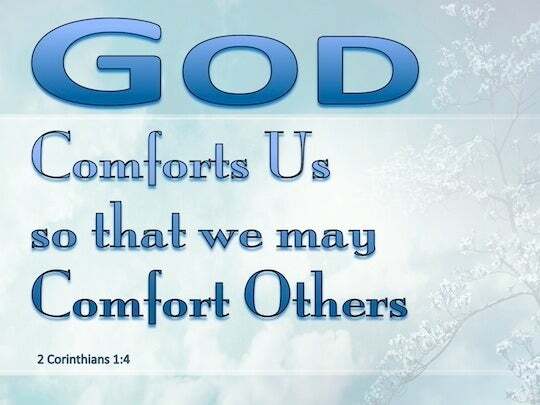 He comforting us in all our trouble, so that we may be able to comfort those who are in every trouble, through the comfort with which we ourselves are comforted by God. which comforteth us in all our tribulation, insomuch that we are able to comfort them which are troubled, in whatsoever tribulation it be, with the same comfort wherewith we ourselves are comforted of God. who comforts me in all my distress, so that I am able to comfort people who are in any distress by the comfort with which I myself am comforted by God. who ever comforts me in all my troubles, so that I may be continually able to comfort those who are in any trouble by the comfort with which God is ever comforting me. who comforts us in all our troubles so that we may be able to comfort those experiencing any trouble with the comfort with which we ourselves are comforted by God. Who encourageth us in all our tribulation, to the end we may be able to encourage them who are in any tribulation - through means of the encouragement wherewith we, ourselves, are encouraged by God. who comforteth us in all our tribulation, that we might be able to comfort those who are in all tribulation, by the consolation with which we ourselves are comforted of God. Who consoles us in all our troubles, so that we may be able to console those who are in any trouble with the consolation that we ourselves receive from him. Who comforteth us in all our tribulation, that we may be able to comfort them who are in any trouble by the consolation with which we ourselves are comforted by God. He comforts us in our every affliction so that we may be able to comfort those who are in any kind of affliction by means of the comfort with which we ourselves are comforted by God. who comforts me in every sorrow I have, so that I can comfort people who are in sorrow with the comfort with which I am comforted by God. Who consoleth us in all our tribulation, that we may be able to console those who are in any tribulation, through the consolation with which we ourselves are consoled by God. that we may be able to comfort those, that are in any trouble, by the consolation wherewith we ourselves are comforted by God. 3 Blessed be the God and Father of our Lord Jesus Christ, the Father of mercies and God of all comfort, 4 who comforts us in all our affliction so that we will be able to comfort those who are in any affliction with the comfort with which we ourselves are comforted by God. 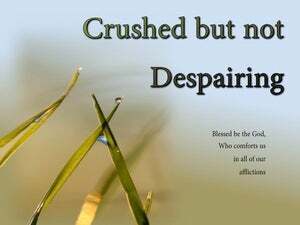 5 For just as the sufferings of Christ are ours in abundance, so also our comfort is abundant through Christ. I acknowledged my sin to You, And my iniquity I did not hide; I said, "I will confess my transgressions to the LORD"; And You forgave the guilt of my sin. Selah. You are my hiding place; You preserve me from trouble; You surround me with songs of deliverance. Selah. My soul will make its boast in the LORD; The humble will hear it and rejoice. Come and hear, all who fear God, And I will tell of what He has done for my soul. Show me a sign for good, That those who hate me may see it and be ashamed, Because You, O LORD, have helped me and comforted me. Then you will say on that day, "I will give thanks to You, O LORD; For although You were angry with me, Your anger is turned away, And You comfort me. "Comfort, O comfort My people," says your God. Break forth, shout joyfully together, You waste places of Jerusalem; For the LORD has comforted His people, He has redeemed Jerusalem. "I will not leave you as orphans; I will come to you. For just as the sufferings of Christ are ours in abundance, so also our comfort is abundant through Christ. For this reason we have been comforted And besides our comfort, we rejoiced even much more for the joy of Titus, because his spirit has been refreshed by you all.